Most buildings aren’t simple extrusions; they bump in and out as they rise. Second-floor decks sit atop first-floor garages; bedrooms cantilever over gardens; intermediate roofs shelter new room additions. Buildings — especially multilevel houses — are complicated assemblies. Figuring out where walls, floors, and ceilings come together takes time, trial and error, and a good dose of spatial reasoning. 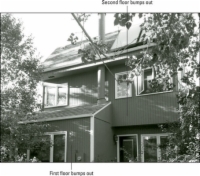 1Assess the alignment of your model’s second floor. The second floor both overhangs and, um, underhangs (hooray for neologisms) the first floor. Wherever this happens, you need to add a new section of exterior wall. 2Draw faces to define any new exterior walls. 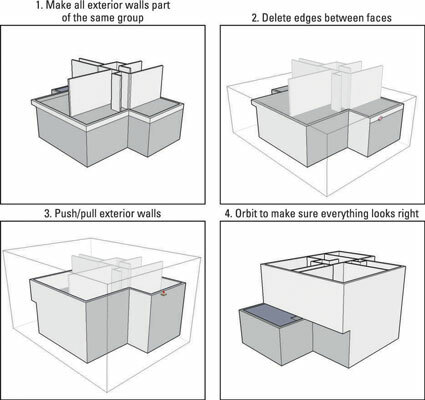 Use the Line tool to trace the inside perimeter of your new exterior walls. Hide the group that includes your second-floor interior walls by right-clicking it and choosing Hide. Select the face that you created when you traced the inside perimeter. Don’t see a face? Maybe you forgot to draw an edge somewhere. Use the Offset tool to offset the edges of your selected face by the thickness of your exterior walls. In this case, it’s 8 inches. Delete the face in the center, leaving only a face that represents your new exterior wall thickness. Unhide the group you hid by choosing Edit→Unhide→Last from the menu bar. 3Make a group out of your new exterior wall face by selecting it and then choosing Edit→Make Group. Delete any floor geometry that doesn’t belong. In this example, part of the floor extends past the exterior wall on the left side of the figure. Double-click the group with the Select tool to edit it, and then use the Eraser to take away only the geometry that doesn’t belong on your new floor, being careful to leave the ceiling that covers the first floor. 4Push/pull down any wall faces to meet the top of the lower floor’s exterior wall. Double-click a group with the Select tool to edit it; you need to do this before you can push/pull any of the faces you created earlier. 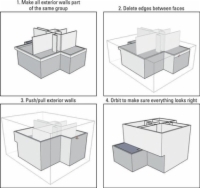 5Make all your exterior walls part of the same group. Select the group that contains your new exterior walls and then choose Edit→Cut. 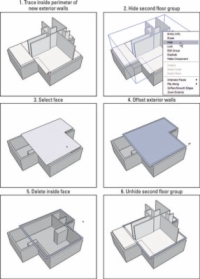 With the Select tool, double-click the group containing your lower exterior walls. You’re inside that group. Choose Edit→Group→Explode to ungroup the edges and faces in the selected group, sticking them to those in the lower group. 6Use Line, Erase, and Push/Pull to extrude your exterior walls up to the height of your interior walls. After everything’s in the same group, adding necessary edges, deleting extraneous ones, and pushing/pulling faces all at once is easier. Using your SketchUp virtuosity, watch the colors as you draw, use the Shift key to lock inferences, and remember to zoom in on what you’re doing.